Well the week is off to a wacky start. Great. :-/ <-Sarcastic Face. Over the weekend I was going through my photo files looking for certain images. I happened to come across this one that I had never shared and since I am having this particular problem at the moment decided to share it now. This Ladybug is on some Milkweed that was growing along the roadside. I transplanted some of it and so far it is living, well 3 out of the 4. So yay. 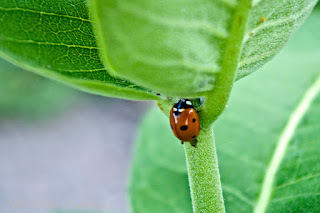 The Ladybug is heading for some aphids that you can see a couple of on the right side leaves. I am having a big problem with Aphids on another type of Milkweed I have and wish the Ladybugs would come and take care of them instead of me.